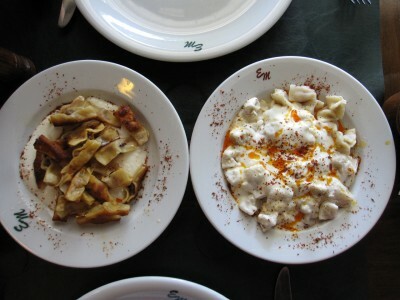 After a while, some Turkish food, like mantı, can become repetitive – serving after serving of the same tiny, boiled dumplings with yogurt. Deeply conservative when it comes to food, Turkish cooks and diners alike generally don’t like any fussing around with traditional recipes. So, distinguishing between a good mantı and a damn fine one often becomes a discussion of minute details such as shape. But be it triangular, a crescent moon or fashioned to resemble a rosebud, more often than not, it is the same old mantı. Still, we’ve found good reason to ladle high praise on traditional mantı, although we are always on the lookout for some downright diabolical dumplings. The folks over at Emek Mantı, in the ritzy Bosphorus-front neighborhood of Yeniköy, answered our call for something different with a menu stuffed with novelty. Paneled in dark wood wainscoting with walls painted dark green, with something easy to listen to – such as Lionel Ritchie and Simply Red – piped throughout the vast dining room, the place feels more like a “classy” airport bar than a hole-in-the-wall culinary discovery. But there is something utterly inspiring going on in the kitchen, namely saray mantı. At a glance, this dish – made up of strips of dough that have been twisted and then fried – looks like it would be named “Barb’s deep-fried Fritos with ranch dressing,” something whipped up by a wacky Texas housewife. After a closer inspection however, we came to think of the crispy mantı as bowtie pasta – the ground lamb folded into the knot of thin mantı ribbons. One whiff of the sauce that was on top of the mantı and we knew that it wasn’t ranch dressing but a yogurt sauce liberally laced with garlic. At once crispy and soft, rich in flavor, never dull, this is mantı to get excited about. Unfortunately, in the world of mantı making, street cred is not earned through zany schemes like the saray mantı, however delicious they may be. Tradition demands that a dainty little boiled Kayseri mantı no bigger than the fingernail be on offer. Emek’s Kayseri mantı was about as traditional as it gets – firm and masterfully folded, the garlicky yogurt and meat-flavored dumplings joined in partnership, not battle, on the palate. Spooning out the last of the yogurt sauce, we were shocked to find not one single scrap of shell or dreg of filling – the hallmark of sloppy kitchen work. This Gülser Hanım, the founder and chief of the kitchen, has got mad mantı-folding skills. On the way out, we saw someone digging into a bowl of glowing green mantı, which, we later discovered, was made from dough run through with spinach. Holy ravioli! We will be coming back for that one soon with the hope of discovering more unusual dumplings on the menu. With a bit more freedom from convention, Emek Mantı Evi could one day very well be the first dim sum à la Turca. for a non-repetitive and unforgetable mantı please visit Ankara. I am sure you’ll get what you expected , more unusual.